I have been noticing from my stats that an increasing number of people coming to Landscape Juice are wanting to know the going rate for a Gardener or Landscape Gardener. In 2004, my company charged a basic rate of £18.00 per hour plus VAT. To this we added some variable starting prices. For example, we could not justify sending a van and two men to a property for just one hour of work work so in cases such as these, two men working on a job for an hour, would have been charged at £50.00 plus VAT (£25.00 x 2) instead of the £36.00. This made up any losses due to extra travelling and lost time and of course fuel. Even though £50.00 seems a great deal of money, running a garden maintenance fleet is an extremely challenging occupation and our feelings were (even in 2004) that the hourly rate for skilled labour should be at least £30.00-40.00. What troubles me greatly is that a householder seems happy to accept a plumber or electrician's price of £60-120.00 per hour but would never give a thought of paying more than £10.00 for their gardener - it was a constant challenge to educate clients. Market forces keep a gardeners pay down - by this I mean that a general lack of understanding by businesses about how to charge themselves out. Undercutting by less than qualified businesses and black market labour meant there was always a good 'deal' out there for a client. In turn this meant we had to compete hard to win work - a situation that should never really occur but it was, and remains, a common problem. There is not a set of national guidelines for gardening or landscaping charges. I realise that there are so many circumstances and conditions that might make a difference to charge out rates. Horticulture is an extremely skilled profession and there are also so many different talented and capable people working in the horticulture industry right down to the odd-jobber (and I am not knocking the odd jobber as that is how I started) sweeping patios and cutting grass for £7.00ph. I have written a series of simple help documents on charge out rates, understanding and factoring in vehicle costs and charging out machinery. The documents will help contractors to work out what they need to charge and also - this is important to help bridge the gap - to educate potential customers about how prices are worked out. We only did a maintenance option for the first year, too much of a pain in the arse. However, I digress, we paid new start-ups £6.50 per hour because they were learning the trade. Skilled ops got £15 per hour, however, I wanted to charge the top people out @ £30+ per hour, however, most clients had coughing fits when I told them the upper rate. The biggest hurdle to overcome is that people do not understand that there are skilled ops and the odd sod bloke who will come a scalp their lawn for them, until it needs returfing. In addition, when we tried to impose a best practice policy that went down like a turd in a swimming pool. People are really scared of plants and lawns and just want things done the "old" way, regardless of professional advice or best practice. I was emailed by a contractor in the states and they are paying £30 - £50 per hour for "good gardeners". We have set up The Gardeners Guild for this very purpose - the absence of a minimum standard / price means that the only other option is to encourage the public to compare gardeners like for like - not just on price. We believe that a career gardener will be proud of his prices and should be able to explain his credentials and why he is worth his fees. This way, people know what they are paying for. Our website displays gardeners details so that people can find a career gardener whose credentials and prices suit what they are looking for. Thanks for your comment Gardeners Guild. I took a look at your site. Well done on coming number one on Google (4.5 million results). Landscape Juice comes about fifth. 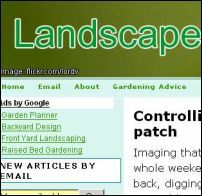 We too have the Landscape Juice network where good gardeners can join and upload all of their information. It is free too. I teach garden design and landscaping and always have to encourage my students to charge more than they thought they should and to see themselves as trained professionals as opposed to 'jobbing gardeners'. However, it is very difficult to get the public to pay professional rates when there are those out there who 'do gardening' for reduced rates to supplement other incomes. Its important that professionals in the trade stick to their guns and charge the rates their training makes them worthy of. I would be all in favour of a charge out structure. When I ran my landscaping company, we often had to take apart gardens built by other companies cheaply and fix all the errors with the poor customer having to pay twice to get the job done right. How we educate the public I don't know but programmes like Rogue Trader help a bit. I feel sorry for my students who have taken the time to learn their trade when they have to compete on price and barely break even just to get work. Part of the problem is that a number of the gardening operations out there don't always pay tax or VAT or put their employees through the books. Glad you brought it up. A good way to save money on hourly payment is using bisonbid.com. Simply post your landscaping project and recieve offers from preofessionals. It will help you to get a cheaper price without wasting your time. "never judge a gardeners work until you know how much they get paid"
sometimes you have to take the work because you need the money. thankfully its not like that for us. we take care of high end residential homes. and we charge between $220-$375 per month. and a few big boys... $1200 a month for a one family residence in brentwood, four guys 2.5 hours a day twice a week...people who spend 50 thousand or more on a landscape architect know the value of maintenance. but you do need to know your stuff. remember the real money doesn't com from maintenance, it comes from all the extra work you end up doing. You get what you pay for is a saying that comes to mind here. Of course there will always be work for the non tax paying, illegitimate business who is'nt insured, turns up on a bicycle and does'nt know a flower from a weed. The kind of customers who employs such people are not the kind of customer that a professional business wants or needs. There are considerable costs with running a business and i think a lot of people in paid employment forget, or do not realise this. The way forward is to price jobs where possible and move away from hourly rates. I do not know any other tradesmen (except gardeners) who work on an hourly basis and their quotes are never questioned - just accepted or declined. I use a firm called The Big Dibber, and am highly delighted. Nothing too much trouble, leaves a clean and tidy garden always. Reasonable rates. Grimsby area. I am a qualified gardener and started my own maintenance business a few months ago and am getting more and more disheartened at the way our trade is treated!I have learnt that some jobs are just not worth taking on as it costs me more in diesel and time to get there than it does in what they are paying me for an hours work! There are some cowboys out there but I spent a lot of time training for what I do and often get treated like a skivvy by some of my customers! Would love some advice on how to go about charging a flat rate rather than an hourly rate. Any advice would be greatly appreciated! Thanks for your comment Fay and welcome to the industry. Don't be disheartened. There will always be some people who want you to work for little or no money. My advice is to work out exactly what you need to be paid (make sure that includes profit) and only work for the clients who are prepared to pay you this. You obviously have to bear in mind your knowledge and skills and the length of time you have been providing a service. To charge a flat rate you have to write down all of your costs. The cost of getting yourself to a job and the profit you want to make and divide it by the amount of hours you wish to work in a year.